« Happy First Solo Day! A few weeks ago I took some days off work and my girlfriend and I drove a rented campervan up to Echuca, on the Murray River which borders New South Wales and Victoria. While exploring the surrounding area we stopped at a small winery in neighbouring Moama (on the NSW side of the river) to escape the stinking heat of the day. The winery also happened to have attached to it a small military museum, so we went in to have a look. It is a scroll as presented to the families of Australian servicemen who died as a result of their military service in World War II. A similar scroll hangs on a wall at my parents’ place, bearing the name of my grandfather’s uncle, RW Purcell. 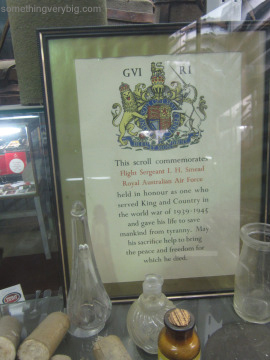 The scroll in Moama commemorates one Flight Sergeant I H Smead – but apart from the name on the scroll itself, there were no details on who he might have been or what might have happened to him. I thought it looked quite sad sitting there all but forgotten in a display case in a roasting tin shed next to the Murray River, so I decided to see what I could find out about him when I got home. Grave Reference Plot A. Row D. Grave 14. I now had a name, service number and date of death – and, most interestingly, information that he is buried in Bundaberg, Queensland. Bundaberg was the site of No. 8 Service Flying Training School at that time. Being a training unit, this suggested an accident rather than enemy action. Going out on a limb, I tried a quick Google search – and came up with Peter Dunn’s Oz At War website which revealed what happened. Irwin Smead was a navigator. He was flying in a Bristol Beaufort on a formation flying exercise on 21 April 1944 when it collided with another Beaufort of the same formation about 15 miles west of Bundaberg. All eight airmen – four in each aircraft – were killed. I also found a copy of the “Preliminary Report Internal External of Flying Accident or Forced Landing” for this accident in the Casualty or Repatriation File of F/Sgt Hardy, the pilot of the other aircraft*, which is digitised at the National Archives of Australia website (A705, 166/17/544). It gives the probable cause of the collision as ‘UNKNOWN’. It’s not much, but finding even this small amount of information adds that little bit more to Irwin Smead’s story. It reminds us that he was more than just a name on a page. *Interestingly there appears to be a disagreement between this source and Peter Dunn’s information about which aircraft were involved in this accident. Both agree on Hardy’s aircraft, A9-476 – but the NAA file shows Smead’s as A9-426. This shows the value of going back to the original documents wherever possible! This will be the last post on SomethingVeryBig for 2012. Thanks to all for your support and comments throughout the year. Have a great Christmas, and I’ll be back in mid-January. It is indeed sad – my father (a history teacher… I blame him for getting me involved in this whole caper in the first place!!) found another scroll from WWI some years ago in an old junk shop. He felt sorry for the man who it commemorates so he bought it and used it as a source for some of his classes over the next few years – keeping that man’s memory alive in a small way. On the positive side, this one for F/S Smead is at least in a museum (albeit a very small one) and not lying forgotten in someone’s attic, or worse. Thanks for your comment!